Here’s a word you might not have heard before: Interpolation. What does it mean? An interpolation is a spurious addition to a written work, added by someone other than the original author. The Bible is replete with interpolations, a clear sign of tampering by persons other than those who originally wrote the texts in question. If we go with the first option, that the Bible is indeed the inspired Word of God and that God also inspired the later interpolations, then we must wonder why God, as the perfect inspirer, didn't get it right the first time. Why did he need other humans, decades and centuries later, to come along and tweak this and tamper with that and add this? Doesn’t this seem to indicate what most academics have been saying all along, that the Bible is indeed merely the work of human beings and not the product of a perfect deity? If we go with the second option, that God did inspire the Bible but failed to keep it safe from future tampering, one must wonder why God cared about the creation of the project but not its ongoing wellbeing. This is a curious possibility to consider when we recall that Christianity views the Bible as God’s special message to humanity. I cannot think of why God would guide the writers and then fail to keep away the tampering hands of future generations. If we go with the third option, that God did not inspire the Bible, no insurmountable theological problems present themselves. Thus, option #3 becomes the most likely choice. Christian academics disagree, however. They have absolutely no problem accepting the blatant signs of tampering that are present in the Bible, specifically the embellishments in the New Testament. Their contention is that since the Bible was inspired by God but written by humans, the human side sometimes overrode the process. This apparently included humans other than the original writers, humans who were sneaking additions in to the text over the years to suit an agenda. What was that agenda? It was God’s agenda, they say. But this again fails to explain why God didn’t get the text right the first time. I can’t help but feel the most flagrant interpolation present in the Bible occurs at the end of Mark, the very first gospel to be written. The earliest surviving manuscripts come from the 4th century, three hundred years removed from the life of Jesus. 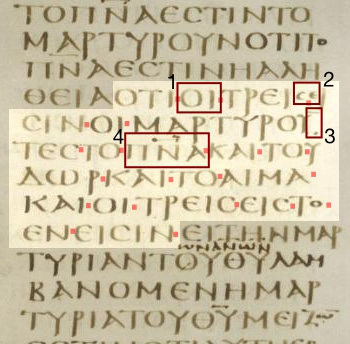 In these earliest manuscripts, the gospel ends at 16:8. Later manuscripts contain twenty-two additional verses not present in the original ones (verses 9 through 20). And guess what! These spuriously added verses tell the story of Jesus’ resurrection. So, the question that begs to be asked is this: Why in the world did God originally not want the story of the resurrection told in what would become the first gospel? Did he change his mind later? Did he think to himself, “You know, I should have put that story in there the first time. I’ll add it in now, even though it’s a few centuries later.” Clearly, this is ridiculous. If the resurrection is true and if God really did want future humans to know about it, it would have been present in his original message. The fact that it was added later seriously undermines the prospect that God was involved at all, to say nothing of the aspersions this casts on the truth of the resurrection in general. And when we recall that the other two synoptic gospels were based on this first one, we can see that the resurrection saga is indeed evolving over time—the absolute hallmark of a legendary story. Moreover, if historians were trying to piece together an accurate history of, say, the Crusades, and within the documents at their disposal was one that contained obvious interpolations from a few centuries later, how do you think historians would treat them? How much credence would be given to these interpolations? Suppose also that we have no way of knowing exactly who is responsible for the spurious additions, exactly when it occurred, and why it was deemed necessary. Would such a text be given serious consideration by careful historians? No way. But as is usually the case, the Bible gets a special pass.